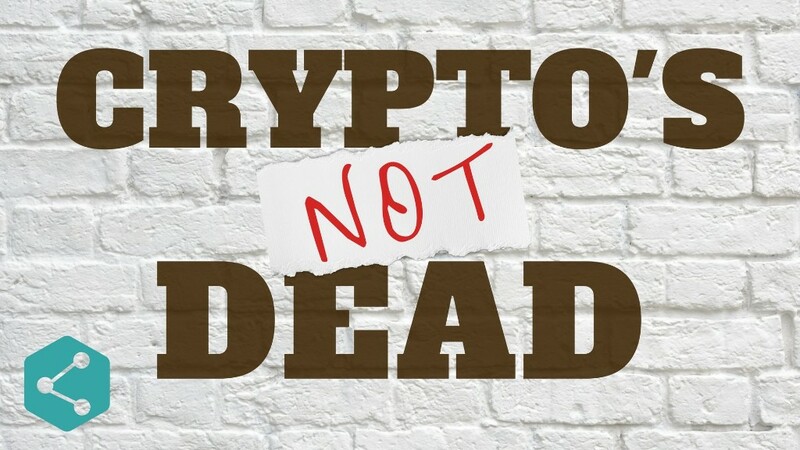 Don’t Believe the Critics, Crypto is NOT Dead! The first three months of 2018 have seen deep corrections in every major cryptocurrency from their all-time highs. The total cryptocurrency market cap peaked at around $820 Billion in early January before crashing to a low of $279 Billion by February 6th. It’s clear we have been in a bear market and we have yet to see confirmation that the ultimate low is in. However, I’m starting to see the extreme bearish sentiment show up again and even some crypto bulls (mostly the late-comers) are starting to wonder if this is the end of crypto. The strongest critics have been governments, central banks, big financial institutions and now the leading information gatekeepers. To be fair, their investment track record is clearly not in favor of new technology. The first tech stock they purchased was IBM in 2011 and then Apple in 2016. They admittedly have completely missed the biggest winners such as Google, Amazon & Netflix so it’s not surprising that they would be so critical of this new and emerging blockchain technology. We all know where Jamie Dimon stands with his comments on Bitcoin around $3,000 (before it shot up to $20,000!). Then there is the heavy regulation and outright opposition by some major governments. China has been one of the harshest critics and Pan Gongsheng, a People’s Bank of China deputy governor, said: “There is only one thing left to do: Sit on the riverbank and see bitcoin’s body pass by one day.” Other central bankers have also called for coordination to regulate and even prohibit the use of cryptocurrency and other blockchain-based platforms. The ICO market has been at forefront of the regulation discussion and in the past week we’ve seen reports of the SEC (Securities & Exchange Commission in the United States) issuing subpoenas to companies that have issued ICO’s, to hedge funds that have invested in ICO’s and to exchanges that trade ICO’s and other tokens they deem to be securities. This ongoing uncertainly has certainly contributed to the recent sell off in the market. Finally, we’re are now seeing more leading internet companies ban crypto-related content and advertising. Facebook announced they would ban crypto ads in January and now Google has stated they will be doing the same. Perhaps there are trying to protect unsuspecting investors from falling victim to another Bitconnect or shady ICO. Maybe, but I doubt that is the only reason and I can think of far worse content being hosted on their platforms. As I’ve stated before, this new technology and the decentralized ecosystem will pose a direct threat to centralized power structures. Such is the nature of anything that is peer-to-peer. These mediums make it easy to circumvent capital controls and those wishing to restrict information. It will be fought but it’s too late to put Pandora back in the box. Crypto is here to stay and it’s just a matter of how it will look in the future and not if it will have a future. Major companies are already adopting and innovating with this technology and blockchain developers are in high demand right now. Since the start of the year, the valuations of cryptocurrencies have been in free fall. Anyone buying at the peak is down anywhere from 50%, 60% or even 80% depending on the coin. During the last quarter of 2017, we saw a climactic run in prices following a strong bull run and now we’re seeing the inevitable correction that follows such strong moves. However, it does not mean that it will go to zero and it does not mean we’ll see prices get as low as they were during the start of the last bull cycle. The question remains; where is the low? There will certainly be projects that come and go and I fully acknowledge that some names will never return to their all-time highs. However, I also believe some of the names we know today will go on to even great heights and names that are not even on the radar now will turn out to be huge winners. This space is young and moving fast. Innovation happens quickly and the market leaders are still being established. Currency and payment systems is just the first app to be put on the bloackchain and we’ll continue to see new uses developed. I believe the platform tokens (such as ETH & NEO) will continue to do well. While the pullback from the peak has been swift and painful, let’s compare current prices to where they were in the recent past. Below are the USD prices for a few of the top 10. In all cases, prices are still higher to where they were 6 months ago and significantly higher if you go back further. At this time last year, the total crypto market cap was $26 Billion! Six months ago, it was around $125 Billion and today it’s still at $340 Billion. My point is not to dismiss the severity of the correction we’ve seen but to put it in context of the longer-term picture. I believe we are still relatively early in this new market and we’ll continue to see big gains and innovations in the years to come. Regardless of the prices, development continues on Bitcoin, Ethereum and Litecoin and MANY other projects and protocols. The financial media will have you believe that anything related to crypto will die off and go away but that couldn’t be further from reality. From an investment perspective, only small percentage of the population has invested in cryptocurrency and many have not looked into the names beyond the top 5 on the market cap list. The younger generation still dominates the space and many of my investor friends are still on the sidelines because they don’t understand crypto or because they think it’s too complicated and risky to buy. The average traditional investor is still not comfortable with crypto and until we see more things like ETF’s, crypto-funds and easier ways to buy and trade them, the market has yet to reach its peak. Markets move in cycles and following this correction we will begin to see a new accumulation phase. This will be followed by a stealth bull run and then ultimately by another craze that takes prices to heights we can only imagine. As you know, I am a believer in the long-term merits of this technology, in cryptocurrencies and blockchain assets. I’m am NOT in the camp that believes that Bitcoin is a Ponzi or that crypto will go away. They will come around eventually. However, I’m not a perma-bull either and as a trader, I do book some profits along the market cycles and wait to scale back in at lower prices. This volatile market certainly makes for some good trading. 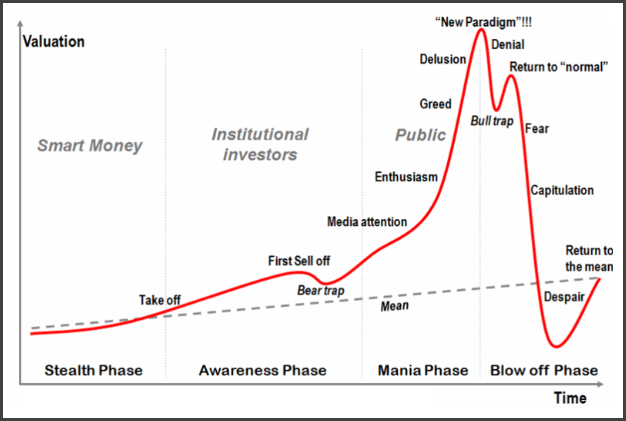 While the next major bull cycle may be a year or more away, we will hit the low well BEFORE that time. We will begin to see the stronger, high-quality projects move first and even if Bitcoin sits tight for a while, some of these alts will see big run ups. By the time the next major bull shows up and all of your friends are talking about it again, the best names will already be up 100% or more. These are the signs to look for near the lows: There will be widespread despair and abandonment from the crypto investors that entered late. The media will declare Bitcoin dead (again) and will enthusiastically reminder you how far down the prices have come. Critics will say “See, I told you so!” even though prices are still higher from where they told you. You will see big volume drops at the bottom as the last of the HODL’ers capitulate and throw in the towel. After being down 70%-80%, you will hear predictions for another 60%-80% drop and you’ll begin to wonder, “maybe Bitcoin is going back to under $3000!? !” Then the market will rally and you won’t believe it because you have been burned to many times by false starts. Then it will go up a little further before dipping again. Then it will start to go up a little more and then a few months later, it will finally be clear to everyone that the low is behind us. All markets cycle and some move faster than others. What makes crypto special is that this is not just any financial market. This is an entirely new asset class. This is an entirely new ecosystem and this technology is still in the early phases and has years (decades) to go before it fully matures. Now is not the time to lose interest in the space or to begin believing the critics. Stay engaged and up to date on the latest projects, research those you’re most interested in and be ready to step in when the opportunity presents itself. I’ll be here to continue sharing my thoughts and opinions along the way.